THE Northern Health Science Alliance has signed a memorandum of understanding (MOU) with Life Sciences Queensland Limited (LSQ) in Australia and another MOU with SCAN Health and World Health Innovation (WIN) in Canada to open the door to working across the Commonwealth countries. These joint working arrangements will benefit UK, Canadian and Australian patients and industry by helping new expertise and research to be shared quickly and effectively across the countries booming life sciences economies. The North of England is a world-leader in health science with a £10.8bn added to the UK’s economy each year from the sector. This MOU will open up opportunities for UK companies to expand into Australia which has a £28bn life sciences economy and Canada, which has a £17bn life sciences economy and for their companies to bring the latest health technology and treatment to the North and vice-versa. Dr Hakim Yadi, CEO of the Northern Health Science Alliance said: “This joint working arrangement means that the life sciences industries in Australia, Canada and the UK will benefit from closer relationships. “There is a real international appetite to work with the North’s health research system – demonstrated by these MOU signings and our recent MoU signing with the leading Singaporean MedTech Accelerator Zicom MedTac Pte Ltd. As a result there are now a number of Singaporean companies conducting research studies in partnership with Northern Universities and Hospitals. “We want to best and brightest companies to come and work in the North of England – and for the best and brightest of our companies to spread their wings internationally. 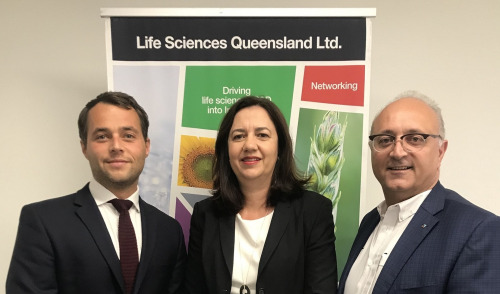 Mario Pennisi, Chief Executive Officer of Life Sciences Queensland Limited, said: “The UK presents a significant market opportunity for our members and this alliance with NHSA provides the perfect entry point to facilitate this. Dr Anne Snowdon, Scientific Director and CEO of SCAN Health and Chair of WIN said: “Partnering with NHSA gives us tremendous reach and engagement opportunities with Northern UK healthcare systems and their respective research networks to advance health system innovation, and broker global health sector collaboration that facilitates knowledge exchange to improve performance, safety and health outcomes. “By working together with our combined members and partners around the world we believe we can advance knowledge and impact of supply chain maturity in health systems." The NHSA is a partnership established by the leading Universities, NHS Teaching Hospital Trusts and Academic Health Science Networks in the North of England. Life Sciences Queensland Limited (LSQ) is an Australian peak industry group, working to assist the growth of individual firms and organisations, and build the profile, capacity and capability of the sector to ensure long term economic, social and environmental benefits to Queensland.